If a current member of your organization only needs access to certain repositories, such as consultants or temporary employees, you can convert them to an outside collaborator. Only members with owner privileges for an organization or admin privileges for a repository can convert organization members into outside collaborators. When you add an outside collaborator to a repository, you'll also need to add them to any forks of the repository you'd like them to access. For more information, see "Permission levels for an organization." We recommend reviewing the organization member's access to repositories to ensure their access is as you expect. When you convert an organization member to an outside collaborator, their privileges as organization members are saved for three months so that you can restore their membership privileges if you add them back to your organization within that time frame. For more information, see "Reinstating a former member of your organization." 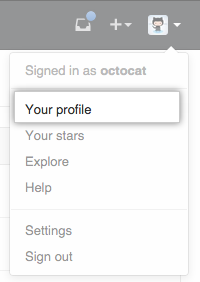 In the top right corner of GitHub Enterprise, click your profile photo, then click Your profile. Under your organization name, click People. Select the person or people you'd like to convert to outside collaborators. 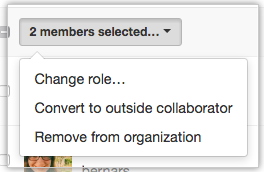 Above the list of members, use the drop-down menu and click Convert to outside collaborator. 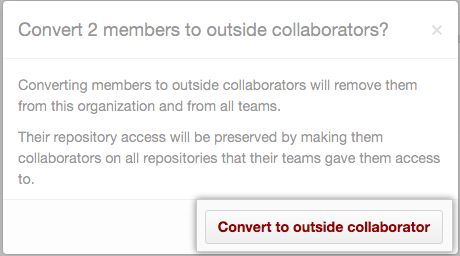 Read the information about converting members to outside collaborators, then click Convert to outside collaborator. "Adding outside collaborators to repositories in your organization"
"Removing an outside collaborator from an organization repository"
"Converting an outside collaborator to an organization member"